The high in Birmingham for March 8th, 2019 was 73F. The low was 52F. The high in Birmingham for March 7th, 2019 was 56F. The low was 29F. The high in Birmingham for March 6th, 2019 was 49F. The low was 24F. The high in Birmingham for March 5th, 2019 was 46F. The low was 24F. The high in Birmingham for March 4th, 2019 was 40F. The low was 31F. The high in Birmingham for March 3rd, 2019 was 54F. The low was 37F. The high in Birmingham for March 2nd, 2019 was 57F. The low was 47F. 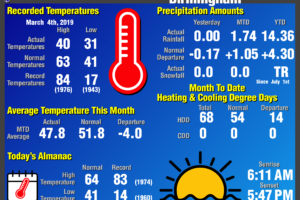 The high in Birmingham for March 1st, 2019 was 65F. The low was 51F. The high in Birmingham for February 28th, 2019 was 69F. The low was 59F. The high in Birmingham for February 27th, 2019 was 75F. The low was 55F. The high in Birmingham for February 26th, 2019 was 69F. The low was 48F. The high in Birmingham for February 25th, 2019 was 62F. The low was 32F. The high in Birmingham for February 24th, 2019 was 69F. The low was 39F. The high in Birmingham for February 23rd, 2019 was 75F. The low was 57F.